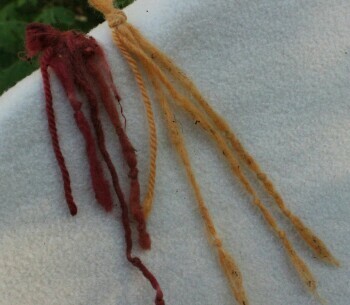 This has been a week of surprises from the dyepots, and surprises are good, right? They keep us on our toes, right? It’s just that, well, why did the surprise have to occur with my lobster mushrooms? The last two years were not conducive to lobsters (Hypomyces lactifluorum), with prolonged dry spells and later than usual autumn rains. Added to that, three of my prime lobster patches—three!—were smack in the middle of the logging road when part of our backyard forest was clearcut three years ago. I use just the outer orange parings of these mushrooms for dyeing, as the inner flesh is white and will simply absorb the pigment (plus, it’s good to eat if you know which mushroom has played host to the parasitical Hypomyces). So I saved up the parings from the three or four stunted specimens I found in the fall, then was overjoyed to find a paper bag of more parings that I’d evidently tucked away a few years ago. This was going to be one very special dyepot! Indeed, the dyebath turned a beautiful orange-red within minutes of starting to simmer, and my sample yarns turned just the colour I wanted. I planned to dye a silk scarf that had taken me hours to stitch a complicated shibori design into, but I hadn’t yet mordanted many of my silks . . . never mind, thought I, I’ll just add some alum to the dyepot. Note to self: take the time to pre-mordant, even if you don’t think you have the time for it. 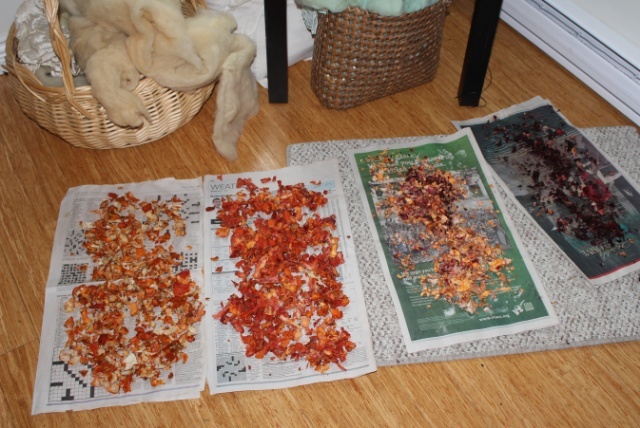 So now I have two silk scrunchies in a lovely peach (after which the dyepot was exhausted) and a hard-earned lesson to apply to this year’s certain (I remain optimistic) bumper harvest of lobsters. In the meantime, I’m still looking for any chemists out there who can tell me what happened!